Ropes, cords, strings, and twine are composed of threads. Many of these threads form helices around helices around helices, or "nested helices" . 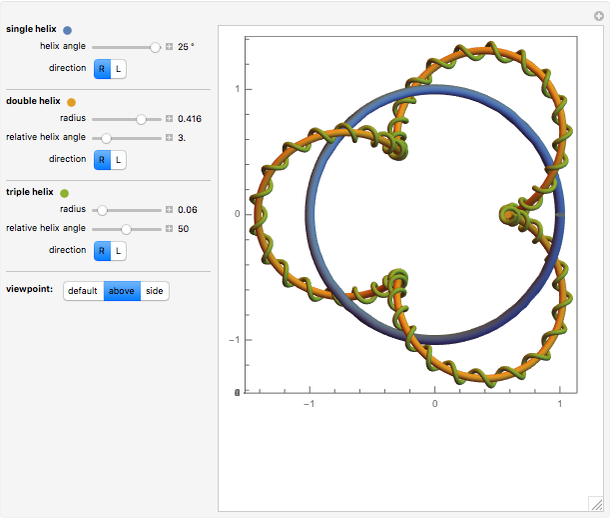 This Demonstration explores the shapes of single, double, and triple helices. 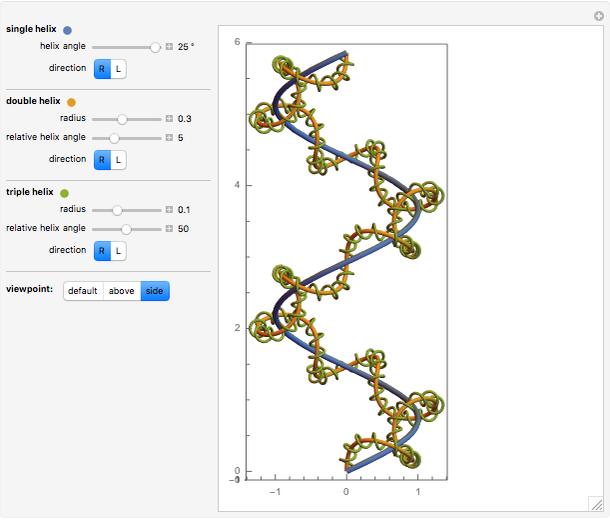 Each level of helix has its own radius, helix angle, and winding direction. This gives limitless combinations of parameters with many different and exciting shapes. 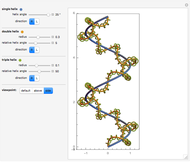 According to , an -tuple helix can be expressed recursively as , with , where the and the are the normal and binormal vectors of the Frenet–Serret frame. 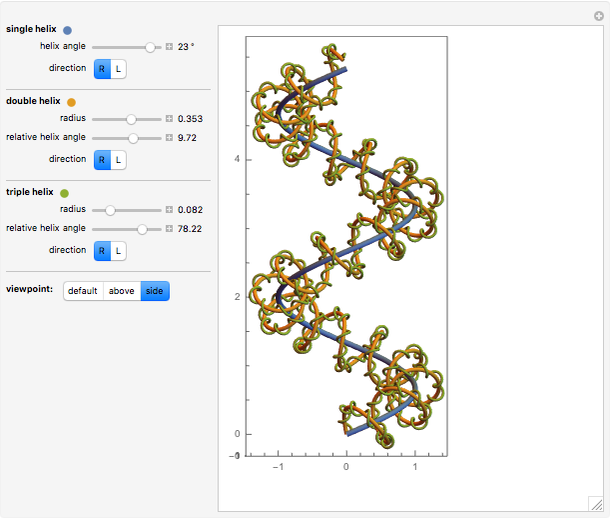 The built-in Mathematica function FrenetSerretSystem computes the normal and binormal vectors and . The are the parametric equations. is the angle of rotation along the helices and is the parameter of the . The are the winding directions ( for right, for left). The are the helix angles. The are the helix radii. 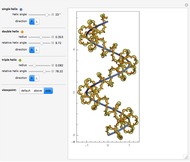 C. Erdo&DoubleDot;nmez, C. E. İmrak, "Modeling Techniques of Nested Helical Structure Based Geometry for Numerical Analysis," Journal of Mechanical Engineering, 57(4), 2014 pp. 283–292. sl.sv-jme.eu/data/upload/2011/04/01_ 2009_ 006_Erdonmez _ 03.pdf. A. T. Ali, "Position Vectors of General Helices in Euclidean 3-Space," Bulletin of Mathematical Analysis and Applications, 3(2), 2011 pp. 198–205. www.emis.de/journals/BMAA/repository/docs/BMAA3-2-19.pdf. 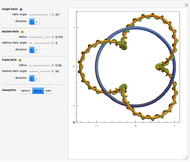 C. Erdo&DoubleDot;nmez, " -Tuple Complex Helical Geometry Modeling Using Parametric Equations," Engineering with Computers, 30(4), 2014 pp. 715–726. doi:10.1007/s00366-013-0319-9.